To be able to respond effectively, Foreman said, officer safety needs must be met. If they face highpowered rifles, he said they need hard armor plates and carriers. The MRAPS – IV, from Baker Ballistics, is a Level IV shield which weighs only 23 lbs. While there’s no way to predict what will happen on any given call, Olsen said officers today have the advantage of obtaining information before they arrive on scene. They might be informed that police have been to the location before or to a potential problem next door, for example. They may even know of a previous rifle threat. When officers know a suspect has, or might have, a rifle, they can quickly add rifle protection in the form of a hard armor plate carrier which goes over a concealable vest. External vest carriers continue to increase in popularity. “External vests are more practical,” Olsen added. 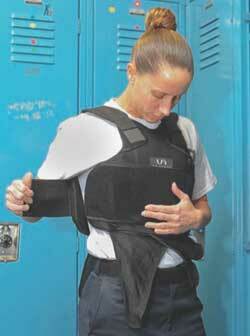 When officers are in a stand-down position, they can open up the sides of the vest to allow air in to cool down. Outer armor carrier designs vary. Some have a soft appearance with room for a badge; name tape; and, maybe, a couple of pockets for handcuffs or a TASER holster. Others have a more tactical look and a complete MOLLE system with attachment points on all sides. A MOLLE (MOdular Lightweight Load-carrying Equipment) system gives officers more options for carrying equipment. Taking equipment off the belt and changing the center of gravity helps reduce back fatigue and strain. 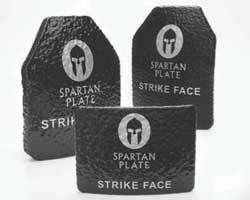 Instant Armor has introduced a new line of insert plates. Some manufacturers have a uniform shirt carrier, an external carrier made of the same material as a uniform shirt. “It’s pretty indistinguishable when it’s being worn,” Olsen said. “It’s like a shirt with no collar and no sleeves which goes over a uniform shirt.” Administrators appreciate that it maintains the traditional uniform look; it’s not intimidating. Officers like it because it allows them to maintain a command presence. Foreman, who has 36 years of law enforcement experience, said officers continue to see emerging threats, more powerful weapons, more deadly ammunition and a growing concern about IEDs. In May, the US Department of Defense reported that Point Blank Enterprises, Inc. was awarded a $68 million multiyear contract for the procurement of the Family of Concealable Body Armor Type-1 and Type-2 vest and outer covers. Foreman said it’s the first time he’s seen the Army request personal protection which included spike and edged blade protection. “We’re going to leverage that technology to benefit our law enforcement market to offer new and advanced stab protection,” he said Olsen continues to educate officers about Polyethylene Rifle Plates which are half the weight of comparable ceramic plates. These 10″ x 12″ plates offer multihit, NIJ Level III protection. They’re durable which means they’re not damaged by dropping or by impact from being stored or transported. The plates’ multicurve surface provides a torso shaped fit. 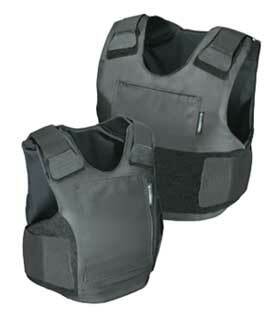 Today, more than 90% of agencies require officers to wear their body armor; the number has grown from 59% in 2009. Most officers comply: 88% reported that they wear their armor all the time when they are on duty. Officersweartheirarmorbecausetheyknow it protects them, not because they are required to do so or because they have firsthand experience – 73% said they had never been shot at or involved in situations in which their body armor protected them from possible injuries, and fewer than one percent reported that they had been disciplined for not wearing it. A majority of officers know how to maintain their armor, but significant numbers do not know or understand certain aspects of recommended procedures and do not adhere to recommended practices even when they do understand them. For example, most manufacturers recommend storing body armor flat, but the survey found that as many as half the officers in the survey use a standard clothes hanger (which can cause ballistic panels to “bunch up”). 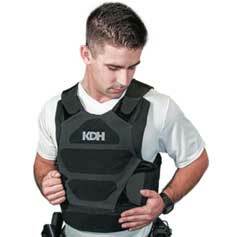 The Transformer, from KDH, is a modular, scalable, concealable armor system. ABA this year introduced several models in its Xtreme SX ballistic package, a hybrid design which uses the newest generation of Honeywell Spectra Shield. The Xtreme SX family of body armor available now includes the standard model and a new female structured model in a Type II threat level. The Xtreme SX Female ballistic package introduces a structured design which contours to the female form for a level of comfort unique to each body. Later this year, Level IIIA packages will be available in both standard and female models. New this year from Armor Express is the Hard Bal, a heavy-duty plate carrier being marketed at a low cost for patrol officers, and designed to meet the needs of an active shooter situation. 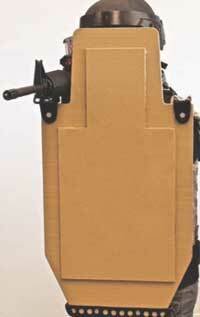 The Hard Bal plate carrier supports 10″ x 12″ hard armor plates. Standard features include a Dynamic Cummerbund System with soft armor pockets; MOLLE Webbing Platform; front and rear hard armor plate pockets; and a 3″ x 6″ ID tag attachment surface (loop). The Revolution is a new concealable carrier system which offers 3mm thick Breathe-O-Prene padding in the shoulder area to allow moisture laden air to pass through as it cushions the area. The external shell is made from high denier microfiber nylon – promoting high durability with water-repellent and antistatic properties. The inner lining consists of Breeze Knit, a moisture wicking, antimicrobial material which provides evaporative cooling. The microfiber Wearstrip on the lower inside lining helps prevent holes along the bottom edge of the carrier commonly caused by abrasion against the duty belt. According to Baker Ballistics, the company’s MRAPS – IV is the first Level IV ballistic shield capable of being quickly and effectively maneuvered without the assistance of wheels during tactical operations by a single armed and ready operator. MRAPS – IV is polyethylene military-grade NIJ Level III composite from edge to edge and internally surfaced with Silicon Carbide (SiC). SiC ceramic armor is rated NIJ Level IV, affixed with carbon fiber. Features include a titanium tube main handle, Kevlar web and bungee carrying system, aluminum armor through bolt protectors, Self- Aligning Weapon System long gun positioning/ aiming devices which index with Picatinny rails, and Instant quick release from multiple body carry methods. It weighs 23 pounds (10.5 kg) and measures 30″ tall and 15.5″ wide. PARACLETE’s Advanced Warrior System (AWS) allows maximum freedom of movement. The HeliX HX02 Ballistic Series from GH Armor Systems is certified to NIJ 0101.06 in Level II and IIIA and is special threats tested. Both models are available in male and structured female designs. The HeliX IIIA, at 1.0 pounds per square foot, is designed to have minimal weight without the stiffness of competing products – and be soft to the touch. Instant Armor, makers of the Tactical Blanket System, has a new line of insert plates. 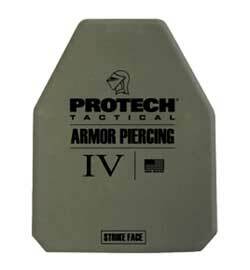 The plates are shaped for chest, back and sides and are available in threat levels ranging from “Special Pistol Threat” up to armor piercing. A modular, scalable platform made with comfort, performance and flexibility in mind, KDH Defense Systems’ Transformer Armor System intends to revolutionize the way traditional concealable armor is used, worn and cared for by law enforcement. An internal speed plate carrier strapping system connects directly to the ballistic inserts, providing a range of adjustability for comfort, snugging the vest close to the body. The Transformer Armor System’s outer carrier sleeves provide quick removal for laundering and replacement with a spare sleeve, or removal for rapid conversion to a mission specific overt carrier. 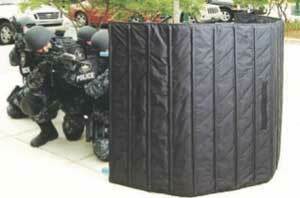 FlexField is an Articulating Ballistic/Fragmentation Barrier which deploys in seconds. The FlexField is storable, highly mobile and can be adjusted to different angles or configurations. It is available in Level IIIA Kevlar (soft) and MultiPanel Level III Hard Armor, and comes with a set of articulating poles. 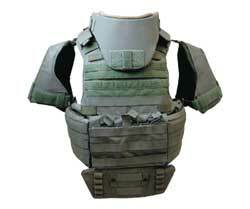 The Advanced Plate Carrier (APC) accommodates soft ballistic panels, hard armor plates and equipment pouches. Combat systems from PARACLETE integrate the latest in military, law enforcement and special ops technologies – providing protection, upgradeability and functionality. Carrier designs allow tactical officers to configure their body armor to meet mission specific needs which include the ability to move from higher to lower levels of protection, while enhancing mobility and agility. A modular construction offers a combination of form, fit and function. The has also developed a new line of tactical accessories and pouches, bringing the “kit” approach directly to the field, along with new helmets, hard armor plates and shields. Advanced Warrior System (AWS) – This newly designed system provides optimum coverage and versatility in fit while allowing freedom of movement. Durable and designed to be highly adaptive, the AWS is modular in construction. The Advanced Plate Carrier (APC) is designed to allow the operator to gain immediate protection against high-powered assault weapons. Blending the functionality of a tactical vest with the simplicity of a plate carrier, the APC accommodates soft ballistic panels, Level III or IV hard armor plates and equipment pouches. The FTOC is a highly scalable, side opening carrier. 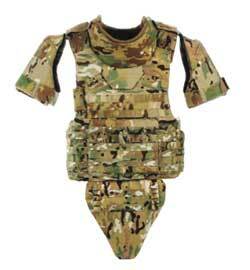 The Federal Tactical Outer Carrier (FTOC) is a scalable, side opening carrier which allows tactical units the flexibility to configure the body armor system to meet mission specific needs. This includes the capability to reduce from higher to lower levels of protection, while enhancing mobility, agility and substantially improved range of motion for the wearer. E.R.T. Shield – Designed in close collaboration with tactical operators, the Emergency Response Team (E.R.T.) Shield satisfies the need for a shield which is light and versatile. The shield is ambidextrous. Leftand right-handed operators can use the same shield quickly without the need to change handle positions. The integrated weapons mount provides for single-handed operation, allowing operators to deploy their firearm. The shield has a solid horizontal handle combined with three soft handles for ease of deploying. Ballistic stab packages from Point Blank Body Armor and PACA protect against multiple threats such as gunfire and edged blade or spike weapons. High-tech fiber materials and designs have brought additional capabilities and coverage to these combo packages. The Emergency Response Team (E.R.T.) shield operates effectively in confined space clearings/assaults, as well as on routine patrol. New Active Shooter Platforms/Response Kits from Point Blank Body Armor enable officers to rapidly don a plate carrier over their existing concealable vest and immediately upgrade their protection when a threat situation escalates. The plate carrier is the foundation of an active shooter response kit because it provides up-armor capabilities which address the threat of rifle and high-powered firearms. The new design focus for PROTECH Tactical’s side opening CAV (Core Assault Vest) core platform creates a high-speed carrier which combines the standard features required by tactical teams with the ability to customize based on individual preferences. The standard CAV package features front and back overlapping ballistic protection and a low profile six inch elastic side closure system. The standard carrier is equipped with a front and back modular webbing attachment system to accommodate PROTECH Tactical TP pouches and accessories, as well as plate pockets on the front and back. 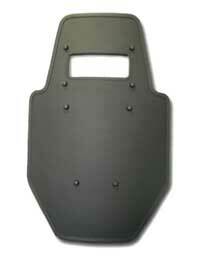 PROTECH Tactical expanded its line of ballistic shields with the introduction of the TSI family of Type IIIA shields. These new shields feature plate design with a military-style shooter’s cut to offer greater range of motion in the arm and upper chest area while shouldering a long arm weapon. This 10″ x 12″ high performing plate weighs approximately 7.5 pounds and is approximately 1.15″ thick. A new Type IV armor piercing threat plate is the Model 2230 which weighs 7.5 lbs. Safariland Ballistics International (SBI) this year launched a line of armor solutions featuring eight carrier models categorized by three specific functional needs: Covert, Multi-Purpose and Overt designated to accommodate ballistic packages developed for the European VPAM and SK1 standards. Second Chance’s new family of armor solutions – The Summit ST – was developed to offer an all DuPont Kevlar ballistic package. The Summit ST family of body armor is available in a Type II and Type IIIA threat level in the standard model and the Type II threat level in the female structured model. The female structured model in Type IIIA threat level is expected later this year. To meet the ongoing need for increased protection at even lighter weights, Teijin Aramid has developed Twaron Ultra Micro – a 550dtex f1000 yarn. Teijin Aramid reports the world’s first ultramicrofilament p-aramid fiber is thinner, yet it provides more ballistic stopping power than any other p-aramid yarn on the market. Twaron Ultra Micro enables up to 20% weight reduction. 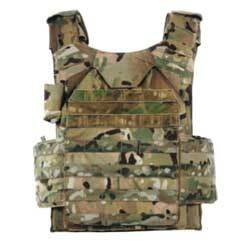 The female version of the Enforcer 5000 vest provides an added level of contour matching for the female body. The Enforcer 5000 is a hybrid armor blend which combines materials such as Honeywell’s Gold Flex, new Spectra Shield II and DuPont’s Kevlar XP and offers NIJ Level II and IIIA protection. The female version of the Enforcer 5000 vest has been designed with formed bust cups, achieved through a darting procedure which provides an added level of contour matching for the female body. The Enforcer 5000 comes with the Advanced Carrier System (ACS) which includes comfort curve, weight distributing Breathe-o-Prene shoulder straps, moisture wicking nylon, and VELCRO fields for maximum adjustment. Insert concealable ballistic panels into the Ready Vest and a concealable ballistic vest becomes an effective tactical outer carrier. You can add rifle plates to the front and back 10″ x 12″ pockets of the Ready Vest and you can attach additional pouches/ equipment to the external MOLLE webbing. Specifically designed for officers operating in the high heat environments of the Southwest, the new USBP Ranger is the next generation of USBP outer carriers. Upgrades to the original USBP model include front and rear rifle plate pockets; internal comms routing channels for reduced external wiring; streamlined cuts for exact panel fit; extended MOLLE surfaces and a quick access smartphone pocket underneath the front badge area. The back plate pocket can double as a hydration bladder sleeve. The system is available in both male and structured female cut designs. About the Author: Rebecca Kanable is a freelance writer specializing in law enforcement topics. She lives in Wisconsin.